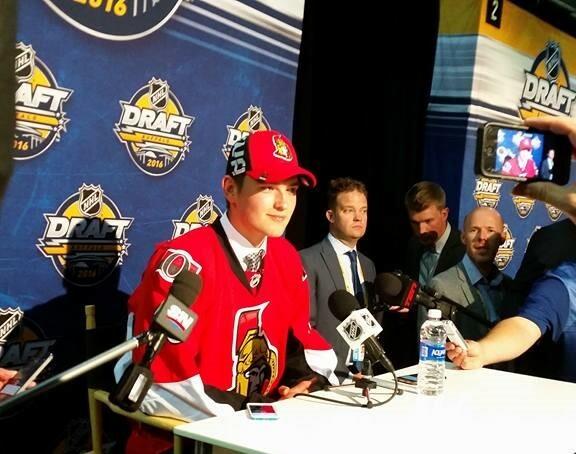 Trades dominated day one of the 2016 NHL Entry draft, but that wasn’t the first bit of news that caught headlines. There was tons of rumors and speculation that the Columbus Blue Jackets would be trying to move the 3rd overall pick to get immediate help or gain multiple assets in the draft. However nothing happened. They were ready to use their selection and it was expected that they would select Finnish forward Jesse Puljujarvi. They went off the board slightly and took Canadian forward Pierre-Luc Dubois, leaving the young Finn Puljujarvi sitting there for the Edmonton Oilers. The move sent shockwaves throughout the hockey world. Not because Dubois isn’t a good prospect, just that Puljujarvi is as step above and the Oilers look like they will leave Buffalo like bandits. After that trades starting flying with the Montreal Canadiens sending Lars Eller to the Washington Capitals for a 2017 2nd round pick and 2018 2nd round pick. The Canadiens then acquired Andrew Shaw from the Chicago Blackhawks for two 2016 2nd picks. So essentially the Canadiens traded Eller for Shaw. While the Capitals adding another center to help them take a run at the Stanley Cup next season, and the Blackhawks clear out some more salary as they look to retool and reload over the summer. Shortly after that the Calgary Flames finally got themselves a goalie by trading their second round pick from this year (35th overall) and a conditional 2018 3rd round pick to the St Louis Blues for Brian Elliott. The Flames had seen struggles in the crease for years and felt that they needed to finally address it, and it’s fair to think that they have with Elliott. He will go to Calgary and be the undisputed starter for a team that looks poised to make a return to the playoffs next season in the West. Detroit entered this draft with hopes of moving newly retired captain Pavel Datsyuk’s contract. Since Datsyuk signed his contract after he was 35 years old, even though he was no longer going to play in the NHL, the cap hit would be on the books for the Wings. They were able to rid themselves of that burden in the middle of the draft, where they moved from 16th to 20th overall and picked up a second round pick from the Arizona Coyotes, while also sending the cap hit to the Coyotes. It looks like quite the move for Detroit, as they can now be active in the UFA market and add another draft pick. There was also some movement of draft picks on the floor with Ottawa moving up to take American born center Logan Brown. The Winnipeg Jets traded with the Philadelphia Flyers to take Logan Stanley. Look for my Day 2 coverage. To close out the day, the St Louis Blues moved up from 28th to 26th to snag Tage Thompson. Although none of the deals today were huge, it still was full of movement and action. There were a lot of rumors trades and speculation that never came to fruition today, and maybe they spill over to tomorrow and we see some more movement.